The Health and Retirement Study (HRS) is a longitudinal health study which began in 1992. TILDA is modelled on the HRS questionnaire allowing for comparibility with the HRS and a number of longitudinal studies across the world which have also followed the HRS design. 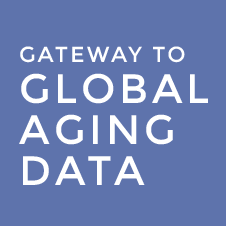 TILDA is currently collaborating with the Gateway to Global Aging Data initiative (G2G) which identifies comparable questions across surveys and has created tools to facilitate cross-country research. The G2G website (http://gateway.usc.edu/) offers a number of facilities including a digital library of all questions for each survey, user guides, a search engine for finding interactive graph tools which incorporate the data harmonised for each study. TILDA is in the process of generating harmonised versions of its public release datasets to allow for analysis between all studies involved in the harmonisation project. For more information on what is available and where to download this data, please see below. Wave 1 and Wave 2 harmonisation are complete and we have just released the documentation and code for the Demographic, Family and Health sections. To generate the harmonised data, you must have the TILDA AMF available. This can be downloaded through ISSDA. The STATA Do-File can be downloaded below. You must update the folder locations and file names within the do-file for where you have saved your dataset before it will run correctly.